A research proposal is much like any other proposal. Here’s how to write a winning research proposal. In recent weeks, I have twice been asked to help with research proposals. In one case, it was simply to edit and rework a proposal for a history/culture project, which included both a permission aspect and a funding aspect (since travel to both Europe and Africa would be involved). In the second case, it was a proposal for an animal behaviour study in South America, including an abstract, hypothesis, literature review, materials, methodology and significance. I know nothing about this topic, of course. But that’s just fine, because the client provided all the information. This was not like being asked to write an article on five ways to prepare sweet potatoes. The client kept feeding me information. The ideas were his own, the writing was mine. So one project was editing with some writing, and the other was writing with some editing. And that pretty much sums it up. Beyond that, these projects were pretty much like writing any other proposal. 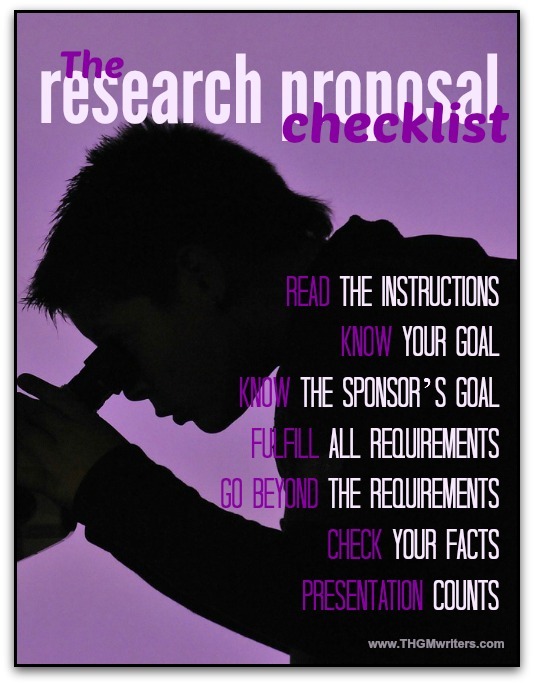 Here’s what you need to do to write a winning research proposal – or any other proposal. This is the biggest no-brainer. And yet, it is where you are most likely to fall down. We humans are notorious for pushing on the pull-door, for heading the wrong way down a one-way street and for correctly answering the wrong questions in final exams. A research proposal exists for one of two reasons. It could be to seek permission to conduct the research, perhaps from one’s educational institution, or perhaps from someone who controls access to critical documents (such as the Vatican Library, for example). Or it could be a proposal for funding. What sections or headings your proposal should have. How the proposal should be formatted – yes, even what font face and size to use. Read the instructions. Follow the instructions. Double-check that you did not miss anything. Wouldn’t it be a downer to be rejected because using the wrong font size or missing a question made you appear less reliable than others competing for the same pot of funding or for a limited number of permissions? This is also obvious, but it helps to write down your goal. Everything you write needs to move you closer to your goal. This is even more important than knowing your own goal. Your sponsor’s goal will set the stage for how you write your proposal. For instance, if your sponsors have a particular interest in Asia, but you wish to conduct research in Africa, you might want to make sure that your literature review includes Asia examples. You might even want to design your outcomes to accommodate an obvious interest in comparing the results of your research to previous studies conducted in Nepal or Indonesia. This is not about selling your soul, by the way – at least not in the example I gave. This is about taking on a partner (they are contributing funds or permission, right?) and including their interests in how you approach the study and in how you display the results. There might be times, when seeking financing from corporations, for example, that there might be pressure to sell your soul. Only you can decide how far you will go to get that money or that permission. Only you can decide where lies the fine line between compromise and capitulation, between partnership and sabotage. If you have been following the instructions, you will see that it is not just about details. There are usually requirements that must be shown. For instance, one requirement might be that you can demonstrate a direct benefit to the local community. Or that the results, if positive, could be applied without any legal or regulatory changes. OK, good. Show this, and show it in spades. You might brainstorm, or you might hire a writer who understands marketing to prepare the proposal so as to demonstrate strongly that it meets the requirements. Caution: no matter how many gazillion added benefits, you still have to show that you meet all of the requirements, especially if seeking something from a big organization (like government). The first phase of reviewing your proposal will be to do triage between those that meet the requirements and those that will make great paper airplanes. If your proposal doesn’t get all the right check marks, nobody will ever find out about all the additional benefits. Only at a later stage will they review the relative merit and value of each proposal. You don’t want to have done all that work just to have a paper airplane as your legacy at either stage. The people reviewing your proposal are busy, but they are not stupid. If you haven’t made your case well, backed it up with facts and double-checked that the facts are accurate, there is a good chance that you’ll end up looking like a fool when one of the reviewers notices that Antarctica is not actually at the North Pole (or notices some more trivial error), which calls into question your ability to deliver error-free research. Make sure it looks professional. If they specify a font, a margin width, or anything else, use it. If they do not, make sure the presentation is neat, clean and easy to read. And proofread, proofread, proofread. If your proposal looks like a mess, what will the reviewers thing your final report will look like? I have written about a research proposal here. But this same approach and these same aspects need to be followed no matter what the proposal, no matter who the sponsor is. This is a solid framework for writing a winning proposal in almost any context. Have I missed anything? Feel free to add to the discussion in the comments below. Is there something else to consider when you write a research proposal? great bullet points David. I know some folks I can pass this along to who will for sure appreciate! Excellent. It is always gratifying to hear that a blog post is useful to readers…and their friends! it bookmarked for my further use and share. I am going to share it in my social pages. It is always a pleasure to hear from you Philip, and I love your comments!